Looks like you're from the United States. Right now, you are on our site for Canada. The getting started manual is an excerpt from the user manual and provides basic information on the R&S®BTC broadcast test center, a Rohde & Schwarz instrument. A detailed description of the R&S®BTC broadcast test center functionality is provided in the user manual. Refer to the data sheet for additional information on the R&S®BTC broadcast test center specifications. 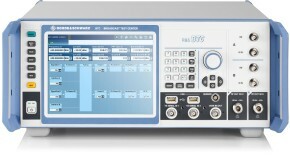 Rohde & Schwarz Canada Inc.